We caught up with F1 legend David Coulthard to find out how a racing driver keeps fit. In cities like Mumbai and Delhi, one craves to drive late in the night, at high speeds. But the maximum speed you can hope to hit would be around 100-120 kmph. Now, imagine driving at speeds above 300 kmph; imagine what a rush that would be. That's what an F1 race is like - a top speed drive, scores of enthusiasts cheering from the stands and the finishing line in sight. Former F1 driver David Coulthard, who drove for the Williams and McLaren teams, was drawn to the sport for this very rush. 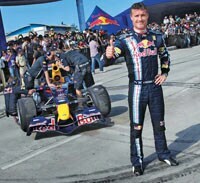 Coulthard has had a long and distinguished career in the sport. Following his F1 debut at age 24 in 1994, he managed over 60 podium finishes till he retired from the sport last year. He says that without a passion for hard work and fitness, it would be impossible to race an F1 car. "The most important thing is to be able to fit in the racing car," he says. The car is small. To fit into it, the driver has to have a slim build - his waist can't exceed 30 inches. Add to that the fact that the driver's height, i.e., the length of his legs vis-Ã -vis the length of his torso, matter, too. When strapped in, the seat belt is so tightly pulled across the driver that breathing becomes difficult. "Natural breathing", as you've heard from your yoga instructor, is what saves the drivers. This isn't all. The car can be driven at its optimum speed and capacity only when the additional weight (read driver's weight) is about 78 kg. Now the driving gear - the suit and helmet - alone weighs 4 kg. "Racing drivers for F1 cannot afford to weigh more than 74 kg when naked," says Coulthard. It's a fine balance to maintain. So, how does a man like him, who stands 6 feet tall, manage to keep his weight at the optimum level? "At least two to three hours of cardio daily is essential whether one is running, cycling, swimming or even rowing," says Coulthard. Next is strengthening the body. This involves enhancing the body's muscle weight-so bench presses, squats, etc., are the norm. "This isn't all. The main reason to go through so much exercise is because the body should be strong enough to take up to 4-5 Gs," says the 38-year-old. Since they drive at such nauseating speeds, to be able to deal with the gravitational force without feeling sick is yet another endurance test that race drivers go through. Other parts of the body that endure the most strain while driving are the eyes and neck. "The neck experiences the most strain because when you're strapped in, there's no movement at all," says Coulthard. Though Coulthard himself hasn't suffered any serious neck injuries, he says, in case of an accident, that's where the pressure will be felt first. It's important to keep the neck muscles firm to avoid feeling any pain while driving. Good eyesight, on the other hand, is vital. So, it's important to eat a lot of carrots and stick to a healthy, well-proportioned diet. "It's become such a habit now that when I don't eat a healthy meal, I feel sick," says Coulthard. He should know, as he's been following his diet plan for almost 20 years now. Does the Rule of 21 work? "Yes, I believe that if you either do or avoid doing something for over three weeks, it ceases to bother you. You won't feel any temptation to eat unhealthily, drink too much alcohol or even smoke a cigarette," he says. And did he have any of those vices himself? "I've grown up now," is all he says evading the question altogether. You don't need to be a racing nut to appreciate the need to be fit. When Coulthard says that he hates it if he doesn't exercise, it's his extreme self-discipline that's speaking. He signs off with a word of advice: "If you're in the habit of exercising, take it a notch higher every single day to build your strength."